NASA’s New Horizons Probe Shares A CPU With Which Of These Consoles? When New Horizons launched in 2006 as part of NASA’s New Frontiers program, it carried with it an array of scientific equipment, enough fuel to get it to the edges of the solar system and beyond, and the heart of a champion. OK, we’ll admit, that last bit is perhaps a bit of poetic hyperbole, but the New Horizons probe runs on a radiation-hardened version of the MIPS R3000 CPU which is—and here’s where the heart of a champion bit comes into play—the same CPU that powered the iconic and best selling PlayStation 1 (and PlayStation 2) game console. Why build the computing core of a super expensive interplanetary probe around a processor designed back in the late 1980s and best known for its role in the guts of a 1990s-era video game console? NASA has never valued speed and power over stability, and while the MIPS R3000 was far from cutting edge at the time the probe was designed and launched, it had it where it counted: it was time tested, stable, and easy to harden and run redundant systems for. After all, if a decade old, $20 garage sale PlayStation 1 still spun up like the day it was purchased, it might just be hardy enough for the depths of space. Finally, a bit of nostalgic bonus trivia: the year NASA launched New Horizons is the year Sony officially discontinued the PlayStation 1. 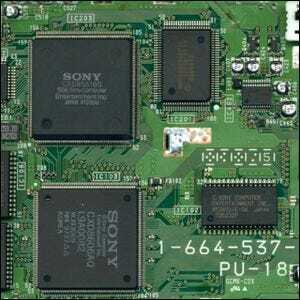 Although it’s certainly not the case, we’d like to pretend that Sony stayed the insertion of the last chip in the last PlayStation 1 unit before sending it to NASA so that the chip could see the universe.